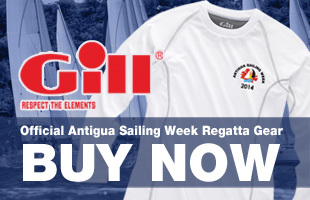 The Antigua Sailing Week Official Regatta Gear from technical sponsor Gill is now on sale in our office upstairs at Antigua Yacht Club Marina. Open from Monday to Friday 8.30-4.30 pm. Check out the range which includes technical race gear with UV sun protection as well as 100% cotton and technical polos. Merchandise will also be on sale in the Gill tent in the Antigua Yacht Club parking lot from throughout Antigua Sailing Week.